Ravi, Srilata 2011. Engaging the Postcolonial: Terrorism, Tourism, and Literary Cosmopolitanism in the Twenty-First Century. International Journal of Canadian Studies, p. 215. 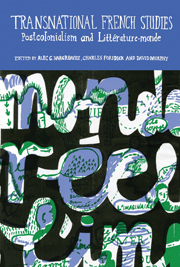 The 2007 manifesto in favour of a 'Littérature-monde en français' has generated new debates in both 'francophone' and 'postcolonial' studies. Praised by some for breaking down the hierarchical division between 'French' and 'Francophone' literatures, the manifesto has been criticized by others for recreating that division through an exoticizing vision that continues to privilege the publishing industry of the former colonial métropole. Does the manifesto signal the advent of a new critical paradigm destined to render obsolescent those of 'francophone' and/or 'postcolonial' studies? Or is it simply a passing fad, a glitzy but ephemeral publicity stunt generated and promoted by writers and publishing executives vis-à-vis whom scholars and critics should maintain a skeptical distance? Does it offer an all-embracing transnational vista leading beyond the confines of postcolonialism or reintroduce an incipient form of neocolonialism even while proclaiming the end of the centre/periphery divide? In addressing these questions, leading scholars of 'French', 'Francophone' and 'postcolonial' studies from around the globe help to assess the wider question of the evolving status of French Studies as a transnational field of study amid the challenges of globalization. Introduction: What Does Littérature-monde Mean for French, Francophone and Postcolonial Studies? Francophone World Literature (Littérature-monde), Cosmopolitanism and Decadence: ‘Citizen of the World’ without the Citizen? Littérature-monde, or Redefining Exotic Literature? Littérature-monde and the Space of Translation, or, Where is Littérature-monde?